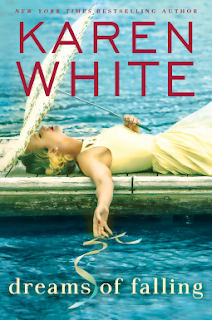 What They Say.....New York Times bestselling author Karen White crafts evocative relationships in this contemporary women's fiction novel, set in the Lowcountry of South Carolina, about lifelong friends who share a devastating secret. What I Say....I am such a Karen White fan. I look forward to her books, and her collaboration books with Lauren Willig and Beatriz Williams - The Forgotten Room was ah=mazing. So getting an advanced copy of Dreams of Falling was a big deal for me. I held onto it and savored it and waited until the perfect time to read it - when I was on a beach in Florida. It did not disappoint. Larkin heads home to help look for her mother, and stays when her mother is found injured in her old family house. While she waits for her mom to heal, she starts digging into why her mother was in the burned down use in the first place. Her best sources of information are her mother's caretakers since childhood, Bitty and Ceecee. They were her grandmother's best friends, and helped raise Ivy when her mother died. But Bitty and Ceecee aren't too forthcoming with information, and they seem worried as she keeps digging, especially around the ribbon tree. And as Larkin tries to unravel the mystery, her mother Ivy lingers in a coma, not sure if she wants to stick around or not. Larkin has spent years running away from all things Georgetown, from her old friends to her true love Bennett and she is terrified to be back facing all of her childhood demons. A great summer read, in the pool, on the beach, on your couch in the air conditioning, on the Kindle app on your phone while you hide in the bathroom at work.